In this time of year, when most of my family and friends are getting ready for the chill of ‘sweater weather’ in the Northern Hemisphere, I find myself increasing more and more confined indoors thanks to the Malaysian rainy season. The weather in this tropical country might not be getting colder but the inclination to remain inside where it is dry and comfortable still remains. When the rainy season comes, it’s all about getting out while you can in the morning before it starts pouring down rain in the afternoon. Once the daily downpour commences, we retreat home to wait out the rain and watch Netflix. As I am from Seattle where it never stops raining, I don’t much mind the downpour. Instead I find it cozy and familiar as it brings out the urge in me to drink copious amounts of coffee, read books and bake things. It only seems appropriate on days like these to indulge in a hearty baked pasta dish and I can think of nothing better to make on a rainy afternoon than pork cannelloni smothered in two different kinds of sauces. Don’t be intimidated with all the components-it is easier than it looks and besides, it’s worth it. After all, when it comes to comfort food, is there anything more comforting that a hefty portion of meaty pasta smothered in a rich tomato sauce and decadently oozing with a creamy bechamel sauce and cheese? I highly doubt it! 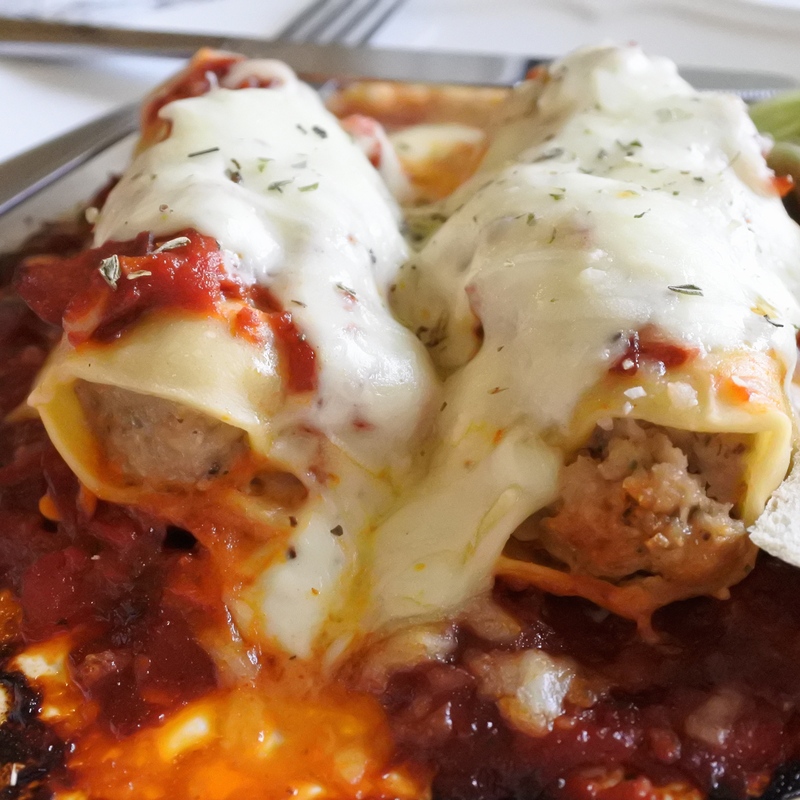 So, take my advice, settle in, put on a good movie and cuddle up to this meaty pork cannelloni with spicy Spanish Chorizo and roasted red pepper sauce. Serve with a side salad tossed in a Balsamic vinaigrette and lots of bread to soak up that sauce. Goes good with a full bodied red wine. In a large mixing bowl, combine minced pork, breadcrumbs, egg, seasonings, salt and pepper together and mix until thoroughly combined. Clean the red bell pepper and cook over high heat either in the oven or on the stovetop flame until skin is scorched and bubbling. Wrap in aluminum foil and allow to steam inside the foil for 20-30 min. When cool, unwrap the red bell pepper from the aluminum foil, scrap off the skin and remove the seeds inside. Empty the canned tomatoes into a bowl and crush the whole tomatoes with your hands. Chop up the roasted red bell pepper and add to crushed stewed tomatoes. In a medium saucepan add olive oil, sliced garlic, red pepper flakes and chopped chorizo and cook on low to medium heat until oil has taken on the color of the red pepper flakes and chorizo as well as the flavor of the garlic. Garlic should be slightly colored around the edges but not burnt, so watch carefully. When ready (oil is red, garlic is slightly golden), add stewed tomatoes and roasted red bell pepper mixture, oregano and water. Stir to combine and cook over medium heat until bubbly and all ingredients have ‘married together’. In a medium saucepan, melt butter over low to medium heat. Once melted, add flour and whisk together forming a roux. Add a pinch of nutmeg to the roux and allow it to cook for 1-2 minutes on low heat. Slowly whisk in milk little by little, whisking constantly to avoid lumps. When all the milk has been added, increase heat to medium and bring to a gentle boil (make sure you give this the occasional stir so as to prevent it from forming lumps or collecting at the bottom). If you are feeling cheesy, add some freshly grated Parmesan and whisk in, allowing it to melt in the sauce. Turn down heat to low and continue to cook for 2-3 minutes. If not using fresh pasta, cook prepackaged lasagna sheets according to directions until they are soft and pliable. Add a line of meat filling to the pasta and roll up into a tube, forming cannelloni. Trim off any excess pasta. In a casserole dish or baking pan, spoon half the spicy chorizo sauce onto the bottom of the pan. Place all of the cannelloni on top of the sauce and spoon the rest of the spicy chorizo sauce on top. Top with white sauce and sprinkle on some Parmesan cheese (if you like). Bake in the oven uncovered at 200C/400F for 30-40 min until the pork filling is thoroughly cooked. Let rest 5 min before serving. Serve with crusty bread and a crispy green salad. Enjoy!